Note: this guide shows how to burn pre-made home video DVD folder (VIDEO_TS) to DVD. If you want to burn video files (AVI, DivX, Xvid, MPEG, WMV, RM, etc.) to DVD please read this one: "How to burn video to DVD?" 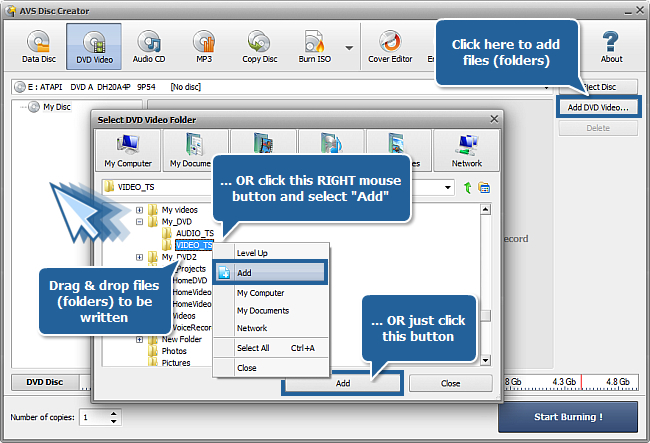 For burning DVD folders you will use AVS Disc Creator. The program interface is very simple. You can make all actions in the same window: select an output drive, add files and folders to be written to DVD or CD and erase data from not-empty discs. As soon as you are ready just click the Start Burning! button to write files to DVD. Click the DVD Video button at the top of the main window to create a DVD disc with your video DVD folder. Click Add DVD Video... button. In the opened Select DVD Video Folder window select a VIDEO_TS folder you want to write. OR just click the Add button. Note: on the disc size meter along the bottom of the interface you can see the size of added files. Select the necessary disc drive if you have several from the drop-down box. Then insert a DVD disc into the drive. If it is not empty, click the Erase Disc button at the top of the main window. Select "Quick erase", then click the Erase button in the new window. Wait a minute to complete erasing. Close this window. Note: if you do not erase a not-empty disc, AVS Disc Creator will delete all files from this disc before writing DVD folder to this disc. Now click the Start Burning! button in the right bottom corner of the interface. Note: before you start burning you can also specify the amount of disc copies, which you want to create, using the arrows in the Number of copies field. That's all. Your DVD will be ready in several minutes!